Fashionista Smile: Kiss InstaWave - Get Curly.. Finally.. It's Hair Style Democracy..! Kiss InstaWave - Get Curly.. Finally.. It's Hair Style Democracy..! Now you can become the next "Curly Fashionista" with Kiss InstaWave, the new automatic, fast, user friendly and tangle-free curler that will help you create gorgeous curls, long lasting beach wave style or the classic Hollywood red carpet style without having to wait hours for your turn at the salon or have to pay for the price of a hairstylist. Discover this amazing and affordable tool to add to your hair styling routine. One of the top hair trends for this cold season is curly hair in any possible expression, from loose and natural waves, to oversize hair, so Fashionista Smile wanted you to catch up by putting to the test the new Kiss InstaWave curler, we can confirm that works well on mid length hair to long hair. The overall hairstyle will depend on the type of your haircut. If you have a layered haircut, you can go for a more defined curl. If have a one length type of haircut, the a softer and natural curl will look great. 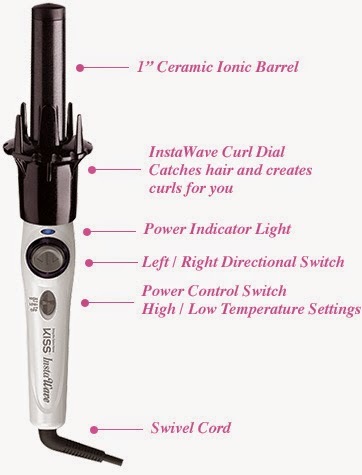 Using the Kiss InstaWave it's easy, simply place a section of hair into the prongs around the barrel, and press the button either toward the right or left to start the curling motion depending on which direction you want your hair to curl. Tangle free, of course. To create a more defined effect hold every section of hair for a longer time, or if you prefer a natural beach wave look just hold every section of the hair for about six seconds. Available online on Target.com and Target stores, Ulta.com, or Amazon.com. To Get the Beach Wave Look in Seconds, just follow the instructions of the video bellow. If you want to get a Hollywood Star Hairstyle, ideal for hair that's shoulder length or longer, watch the InstaWave video bellow. To Get Salon-Quality and Gorgeous Curly Hair, watch the video bellow on how to use Kiss InstaWave. Available at Target stores and online on Target.com, Ulta.com, or Amazon.com.